If you want to start at the beginning of the walk just head to Jennifer Rizzo here. 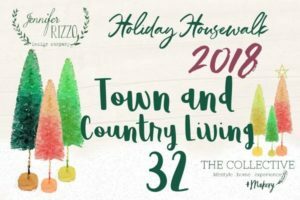 If you are coming over from Jennifer Zuri’s blog at Town and Country Living – Welcome!! Her home is so much fun to tour! For those of you whom I haven’t met, my family and I live in a 100 year old home in Southern California. Only two families have lived in the home as it passed through generations in both families. We bought the home from my husband’s parents in 1998 and remodeled it three times to add a larger kitchen and family room, a patio, kitchen and pool area, and the master bedroom/bath and third floor. We have raised our three sons in our home and I am so happy that they all still love to come home! 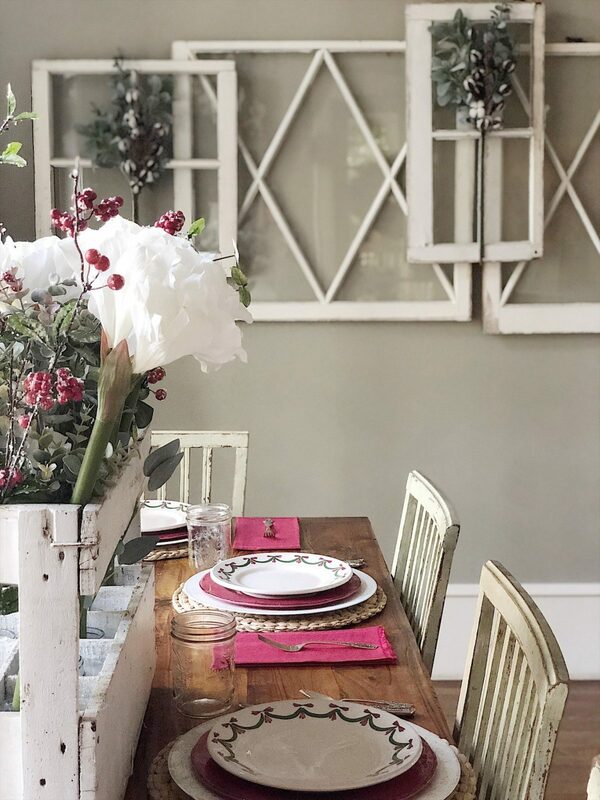 My Christmas decor theme this year is red and white. I tried really hard not to over do it as I find myself much happier with less decor. 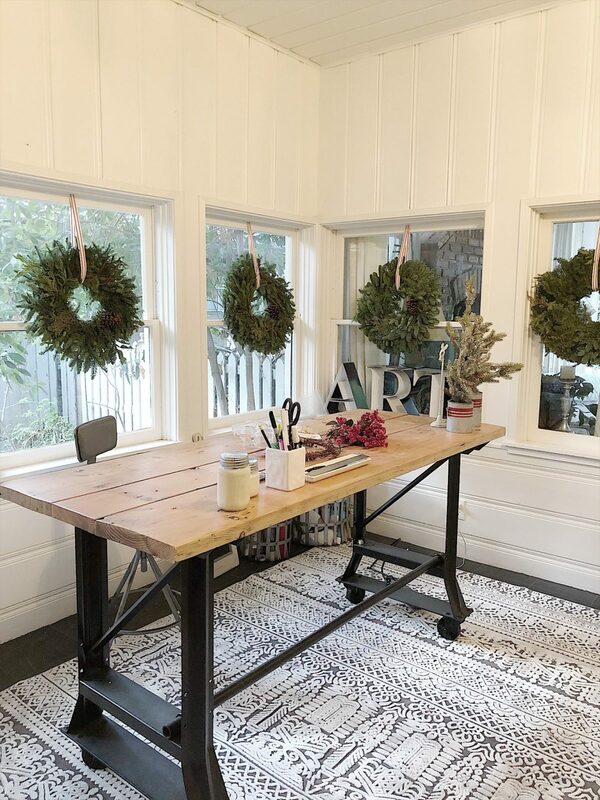 I am very curious to find out what you think of my minimal holiday decor look. 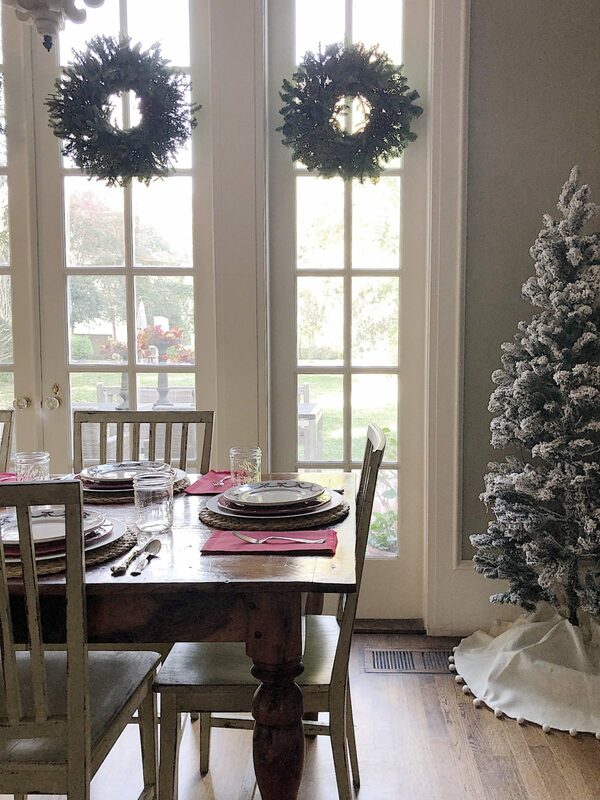 Every year I buy a carload of fresh green wreaths at Trader Joe’s and put them in every window in our home. 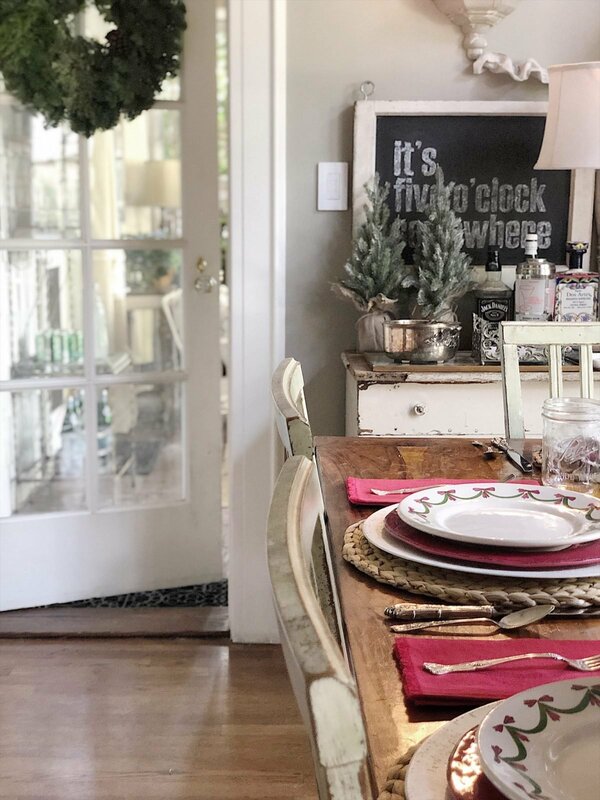 The fresh evergreen smell is so wonderful and it’s always the first thing I do to decorate our home! You can probably tell my decorating style is very flea market vintage. I am a big flea market shopper and I always share my vintage shopping trips on my Instagram and Instagram Stories. I would love it if you would join me! 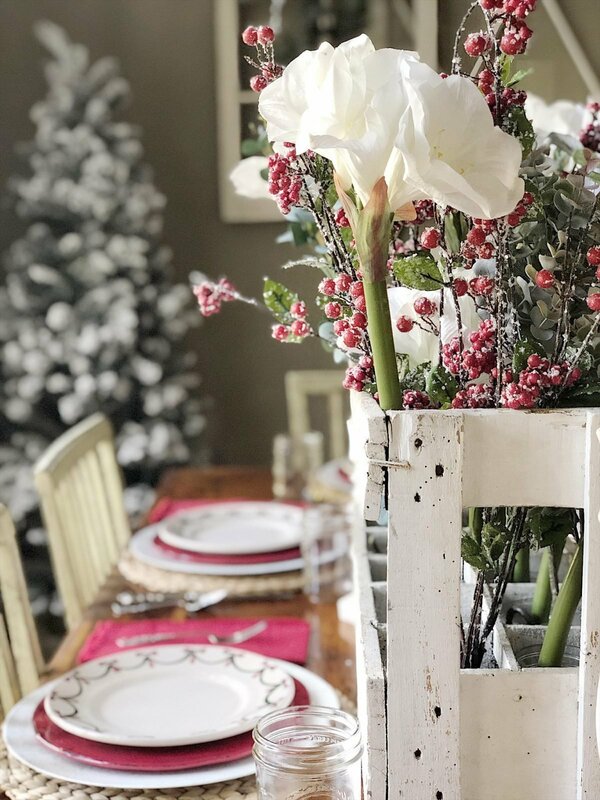 My favorite item in this room is the French Champagne Crate that is holding the Christmas florals on our dining table. I bought this from one of my favorite local vintage dealers, Debra Hall Lifestyle. The three chandeliers are hanging from a vintage ladder I found at a flea market. And yes, those are old white windows hanging on our wall. I get asked all of the time about these Christmas plates. I bought them about fifteen years ago and honestly, I have no idea where I bought them! 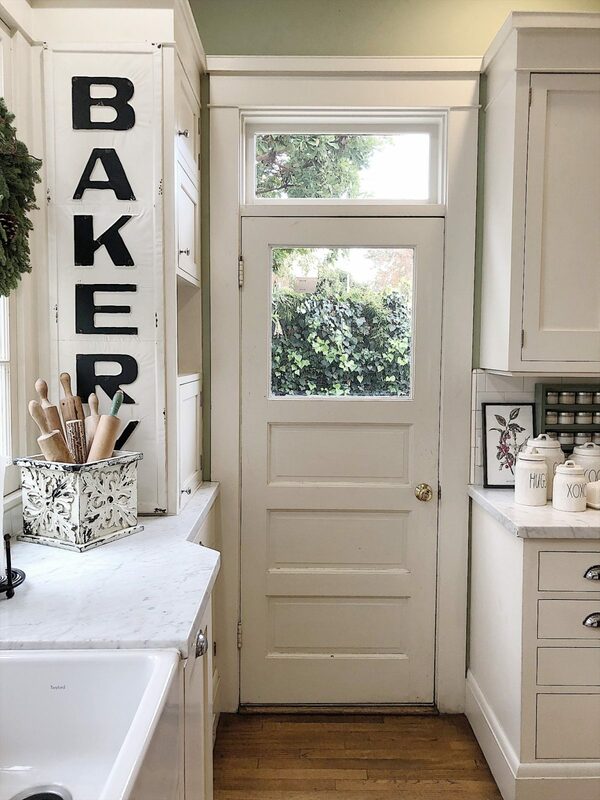 We remodeled our kitchen eighteen years ago and it is by far my favorite room in our home. 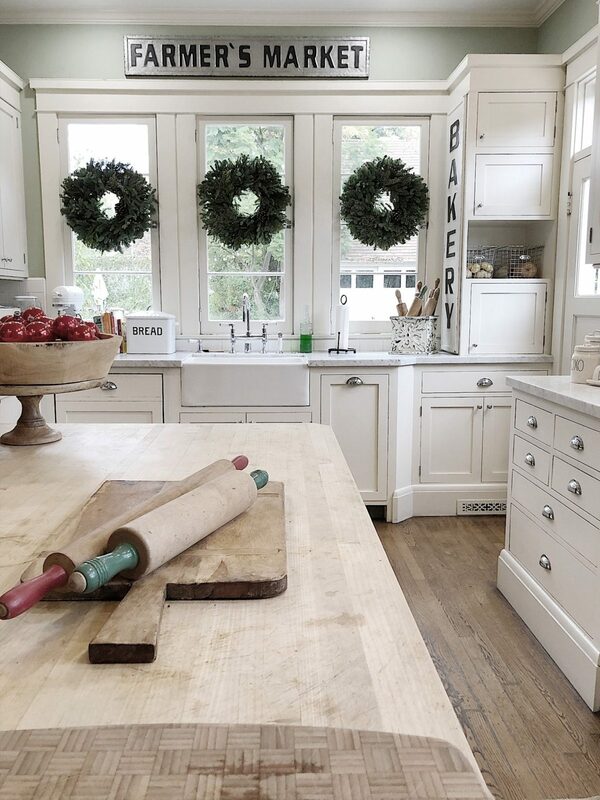 As you can see I added more fresh wreaths in all five of the kitchen windows. 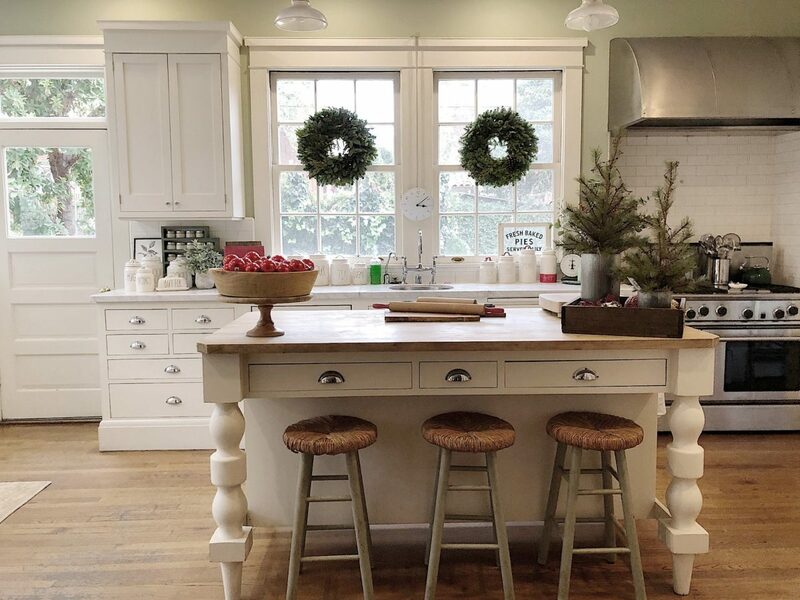 I added vintage red ornaments in the bowl on the island and a few small trees. This year I decided to put all of my trees in vintage crates and I knew I had to do the same with the trees on our island. The red and green rolling pins are from the Rose Bowl Flea Market. It’s one of the best flea markets in Southern California and it’s only ten minutes from our home! I usually refer to our kitchen as a “working kitchen”. I love to cook! Every Christmas we host a holiday party for about 200 people and somehow I still manage to cook all of the food. I know it’s crazy, but I enjoy it. Ok, most of the time I enjoy it. I usually make about eighteen hors deourves and eight desserts. All of our guests are well fed and the food is really good. The only way I can pull this off is with my color-coded spreadsheet. I have broken down every task by day and by color. So as long as I stay on track every day, I can get it all done! Please know that I hire staff on the day of the party to cook all of the food I have already prepared. So I even get to enjoy our party too. 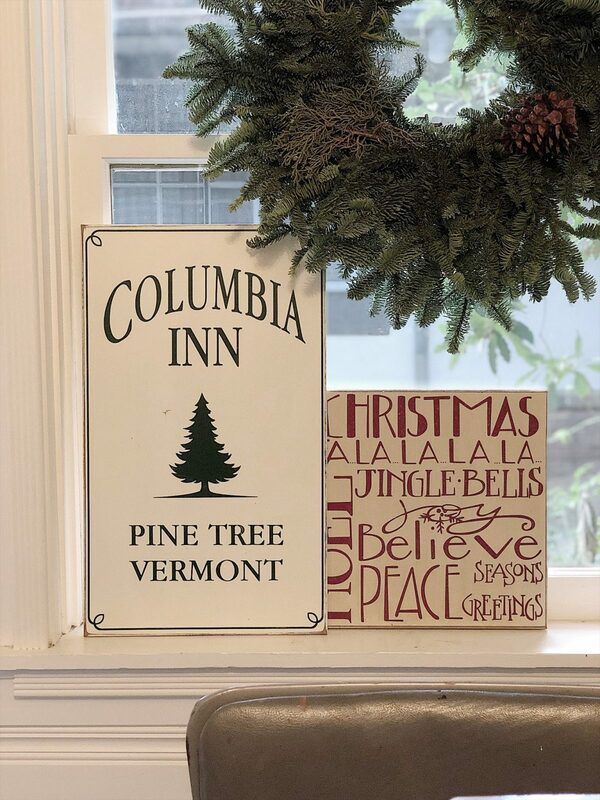 The two-sided Christmas sign on the counter was made by my friend Kasey at Crafting in the Country. I love the vintage look. 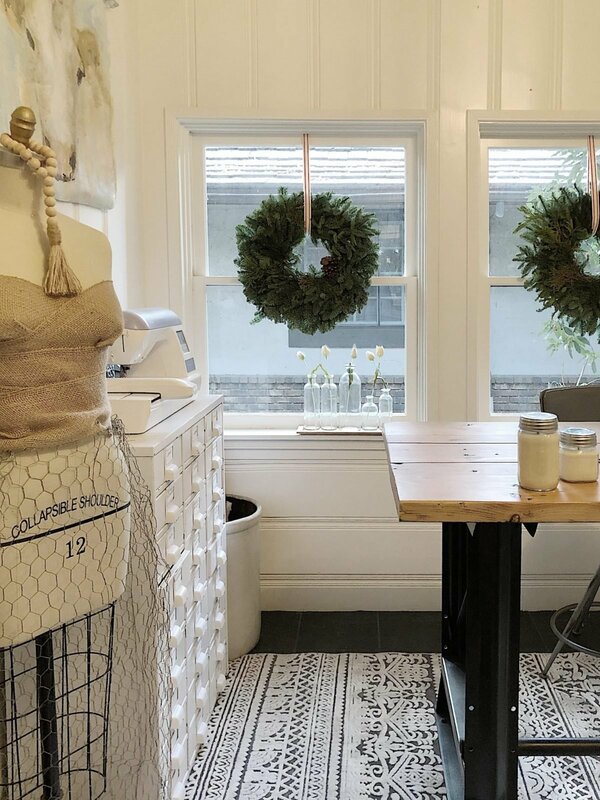 My craft room is a fairly new addition to our home. Last year I was sitting in my dark brown “office, doing yet another craft on my desk. It suddenly occurred to me that I did not need an office. I needed a craft room. So I moved out all of the furniture and painted the walls white. You can see the transformation here. It’s pretty amazing. Next, I found my craft table. Of course when I bought it, it was painted turquoise. A lot of sand paper, elbow grease and black paint transformed the table to exactly what I needed. 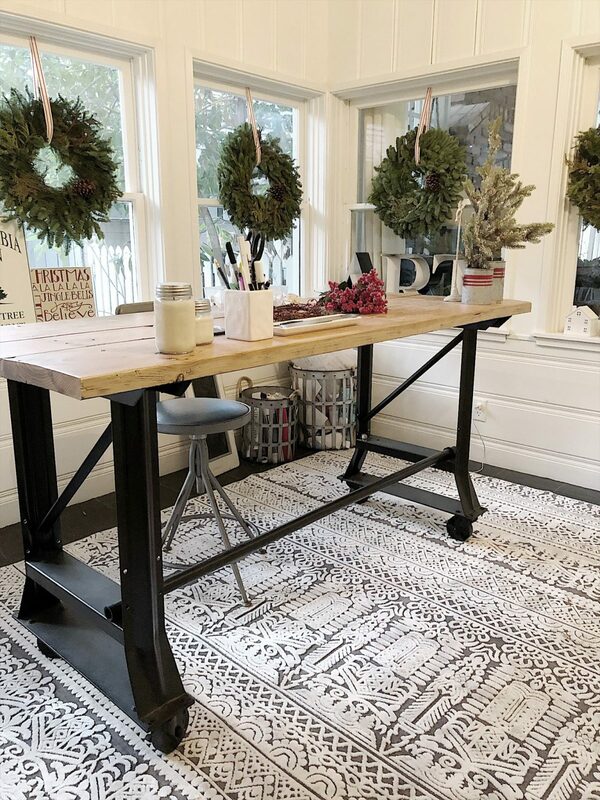 The rug is new and it’s from Rugs America. It’s the Paloma Sebring and I absolutely love it. Last year I made a fresh evergreen skirt for my dress form. I will be doing something similar, but different, this year and I can’t wait to share it with you. If the green sign in the window means anything to you, then you know my favorite Christmas movie is “White Christmas”. Of course, I added the fresh greens in the windows. 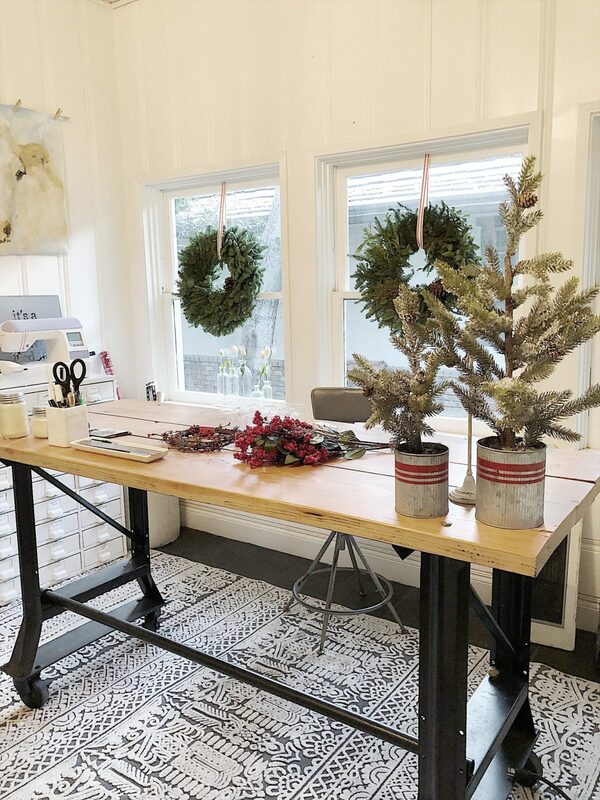 And my craft table has already been in use with many Christmas crafts! I will be sharing the front of our home, entryway, living room, dining room and back porch over the next few days. I hope you are as excited as I am to see what I have planned for this year. 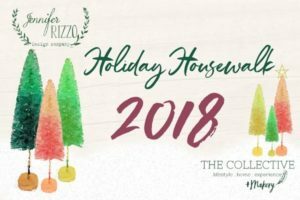 Thank you so much for joining my holiday home tour 2018 on the holiday housewalk! Please make sure to stop back every day this week to see all of the gorgeous homes! 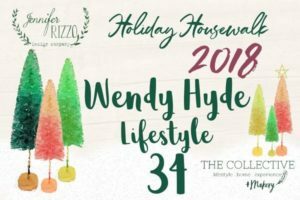 Now head on over to Wendy Hyde Lifestyle to continue the Housewalk. Love your home and your kitchen! 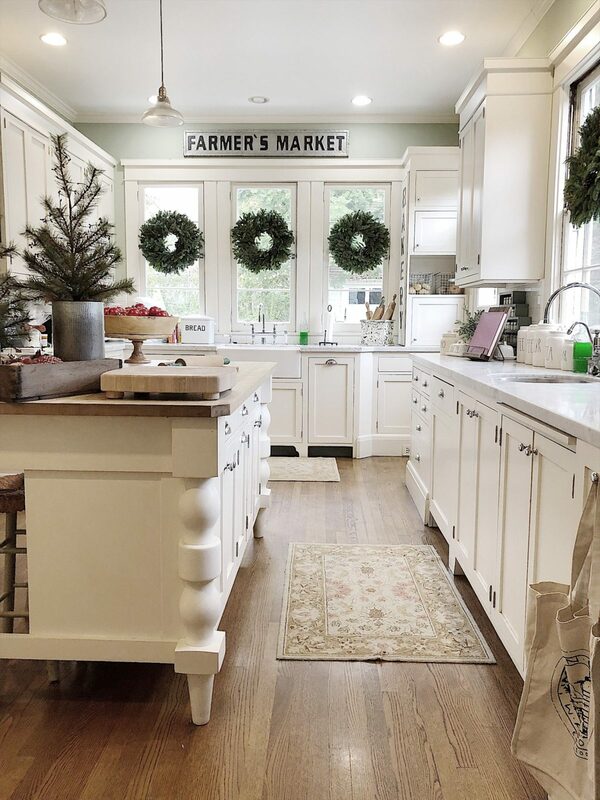 Where is the rug in front of your kitchen sink from? Thanks! I love the way you have decorated for Christmas. I can’t wait to see rest of the home. 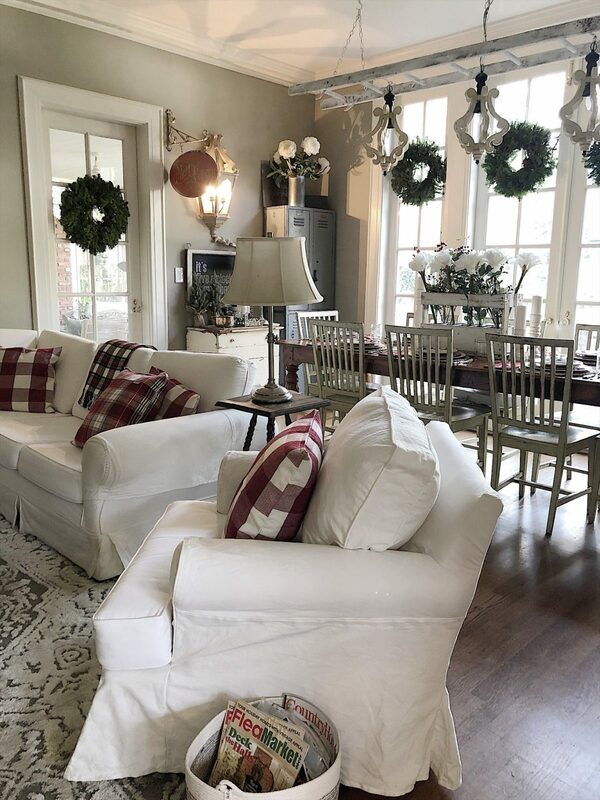 leslie, your home evokes such a feeling of warmth and cozy for the holiday season. 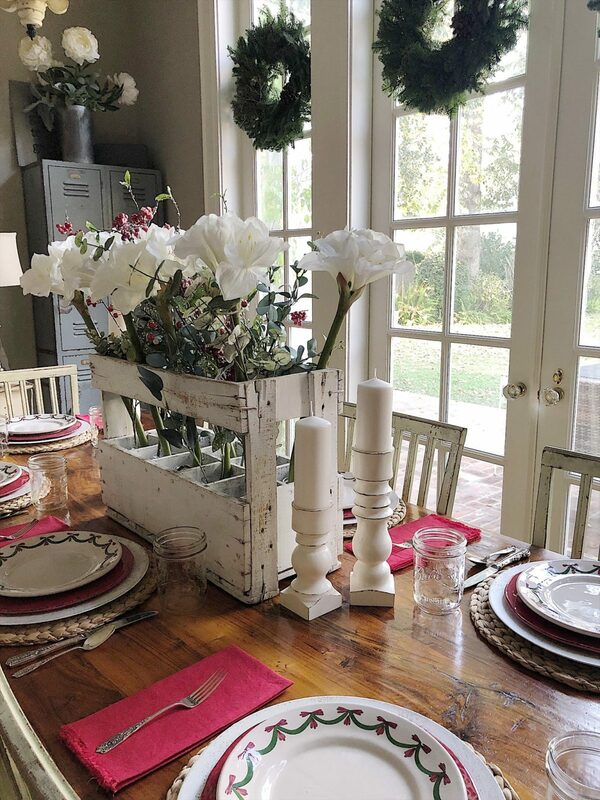 cooking and hosting for 200 is no easy task….but at least the house is ready. Happy holidays. Another home run, enjoy the holidays. I so love you home, Leslie. You’re an inspiration as I go about finally renovating our modest ranch style home here’s in La Canada. 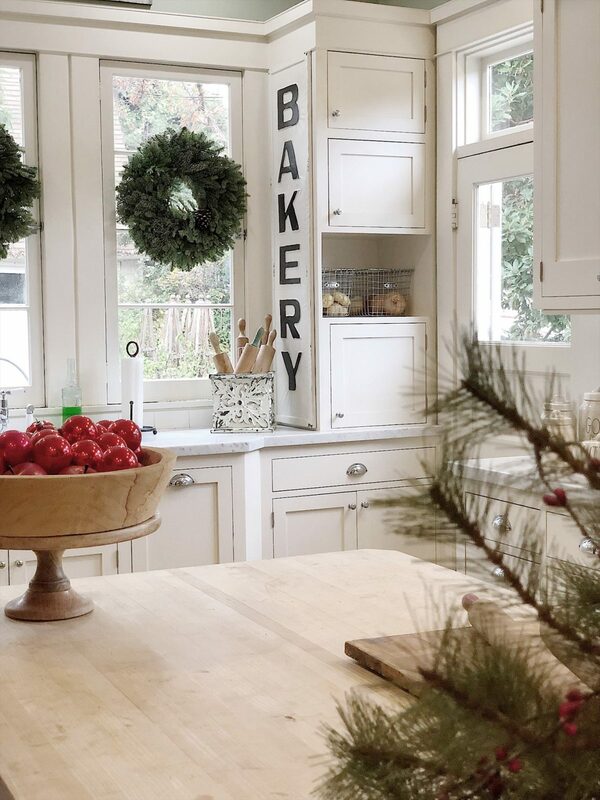 How do you hang the wreaths so as to not see all the hardware? Do you use floral wire? Your home is absolutely gorgeous! Oh my goodness, 200 people, I stress with 50 people! I know everyone will love celebrating in your beautiful home! Beautiful home and I love your style! I can’t find how you keep your white slicovers so clean and white! Your kitchen was remodeled 18 years ago? It looks. Brand new! Love how the style has already come back around!